Store owner Bill Baumler is surrounded by some of the estimated 100,000 beads in his shop. There are beads everywhere – on the walls, on shelves, on tables, in display trays and in cups. Some are packaged in bags, while others lie loose like shiny, little baubles just waiting to be discovered. Bill Baumler took a look around and quizzically shook his head when asked exactly how many beads he has in his store. Baumler then guessed he has about 100,000 beads. 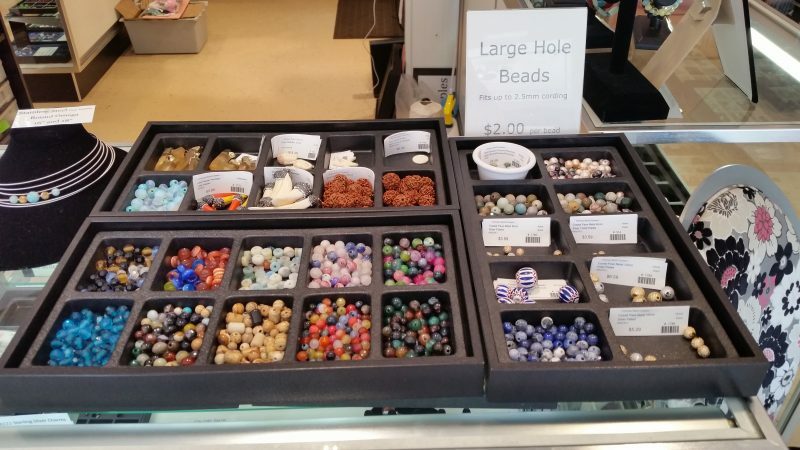 Made of glass, gemstones, fresh water pearls, quartz and many other substances, they come from all over the country and world to Baumler’s Potomac Bead Co. store on the 900 block of Asbury Avenue in Ocean City. If Fort Knox is the nation’s safe place for gold, then Baumler’s shop seemingly is the country’s repository for beads. But Baumler is more than happy to share his bounty with his customers. Potomac Bead is the place where many do-it-yourselfers come in to make their one-of-a-kind creations. Customers also have the option of letting the store employees design and make their beaded necklaces and bracelets for them. “People come in all the time and say, ‘Help us make something, or design something for us,’’’ Baumler said. From left, customers Shelley Rosenfeld and Jill Goldstone, both of Margate, receive help from Potomac Bead saleswoman Jen Swavely in a beading class. Baumler recalled one customer who spent a full six hours in the store, meticulously perusing all of the beads before she finally picked out what she wanted. 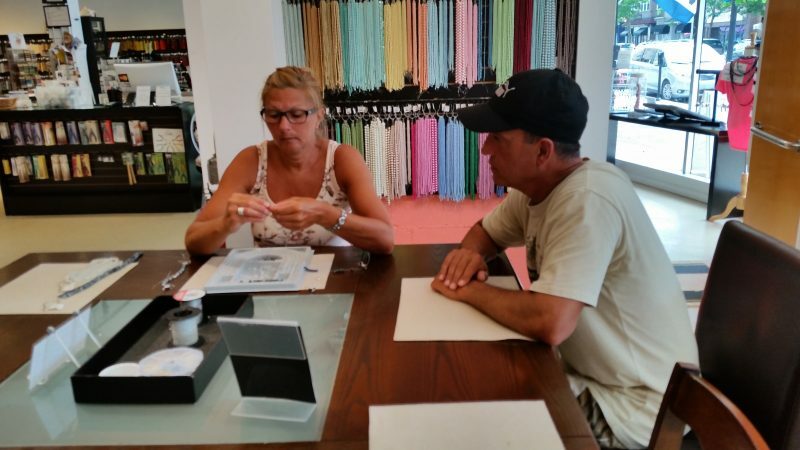 Jen Swavely, a saleswoman at Potomac Bead, said the woman who spent six hours in the store is an example of how much time Baumler is willing to devote to his customers. “Bill is extremely patient,” Swavely said. Colorful beads fill up display trays on a counter in the front of the store. On Friday, vacationer Kristen Devinney, of Westfield, Union County, brought her 4-year-old daughter, Ada, to the store to make an animal-themed bracelet for her and her 2-year-old sister, Willa. “We came here last year and did it for the first time. We liked it so much that we decided to make it a tradition,” Devinney noted. Pint-sized Ada gazed in wonder at all of the colorful beads. She said she wanted to make another animal bracelet, just like she did last year. “It has a doggie on it,” Ada said. Chantal Richard, a tourist from Quebec, Canada, was busy making a bracelet on Friday while her husband, Alain Girard, looked on with fascination. They had tried beading for the first time a few days earlier and decided to do again. “She loves it,” Girard said. “We will come back again next year,” Richard added. Canadian tourists Chantal Richard and Alain Girard, who are married, enjoy some quiet moments making a bracelet together. Once they pick out their beads, customers can sit down at tables to begin crafting their own designs. Store employees are there to help guide novices through the process of making their necklaces or bracelets. Although most of the customers are women, Baumler said that men will also come into the store to try their hand at jewelry design. Boys will also give it a shot. To get started, customers pay a $5 stringing fee. The store supplies the wire, clasp and crimps for their necklace or bracelet. The final cost of their jewelry depends on which type of beads they choose. Baumler, who lives in Lancaster, Pa., but has a condo in Ocean City, co-owns the store with his wife, Sue. 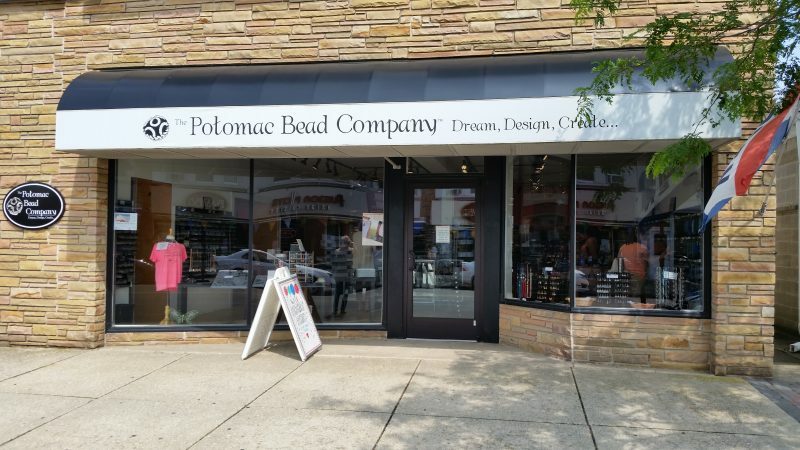 It is a franchise store that is part of the Potomac Bead Co. corporate parent owned by the Baumlers’ daughter, Allie Buchman, and her husband, Nathan. Bill Baumler said that he and his wife bought a bead set for Allie when she was in the fifth grade, which apparently served as the inspiration for her to start the Potomac Bead Co. in 2005 after graduating from Dickinson College in Carlisle, Pa. 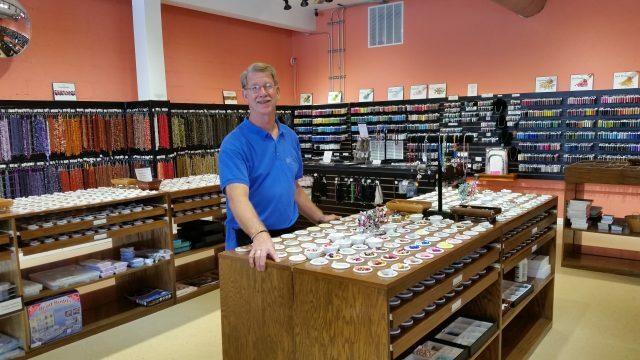 The Baumlers, who had spent summer vacations in Ocean City for years, originally searched for a store for Potomac Bead in their hometown of Lancaster, Pa., but couldn’t find anything big enough. They then set their sights on Ocean City, originally opening up a shop at 910 Asbury Ave. in 2010. Wanting more space, they moved to a larger spot, essentially a double store, at 944 and 948 Asbury Ave. in 2014. Potomac Bead is located on the 900 block of Asbury Avenue in the heart of downtown Ocean City. Potomac Bead is open year-round, including seven days a week from Memorial Day to the last week of September. During the rest of the year, the store operates on Fridays, Saturdays and Sundays. The Ocean City shop is one of four Potomac Bead Co. retail locations. The others are in Hagerstown, Md., Mechanicsburg, Pa., and Alexandria, Minn. The company also has an online business at www.potomacbeads.com/.